Targets are here and we hope you’re prepared for the arrival of this highly requested software feature! We know you’ve been waiting to see what we’ve developed, so let’s get into the details. Yes, targets are for you! Whether you run commissions, already have targets, simply set goals or want to improve the performance of your business, targets are for you. Best of all, regardless of how you’re currently setting targets, it’s super easy to integrate Kitomba targets into your day-to-day business life. Plus it’s fast, easy and better than any notebook, spreadsheet or running reports. That’s right, you can set individual staff and business targets. For your staff, targets is going to change the way you motivate, inspire and empower your team. 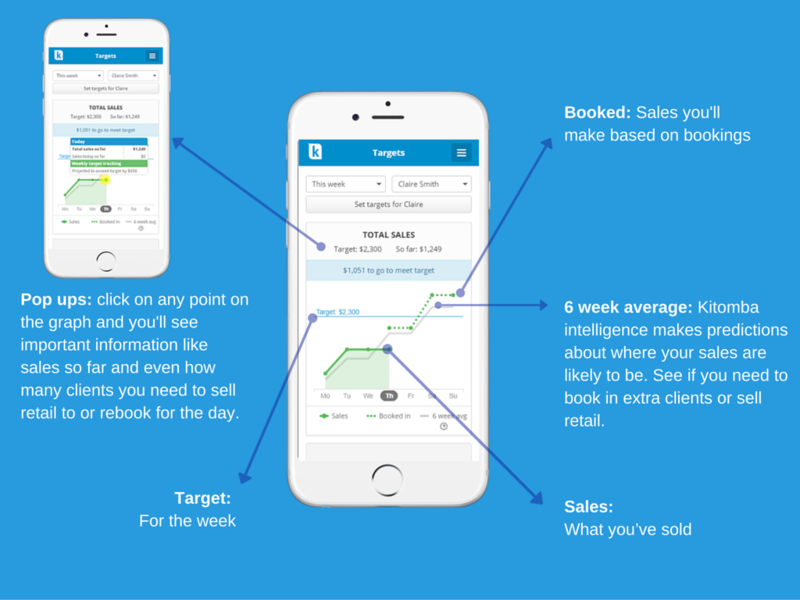 Set the same target for everyone, or create targets customised for each individual to ensure they’re realistic and actually drive them to deliver the results you want. Setting individual targets benefits everyone – your staff make more commission and your business makes more money. You can also set targets for your business. Whether you need to formalise your goals, have an easy way to track your progress or simply motivate yourself, business targets can do that. Here’s some great tips on creating your business goals. Total sales: total value of products and services sold. Service sales: total value of services sold. Retail sales: total value of retail products sold. Appointment retail sales: total value of retail sales sold as part of an appointment only. Total appointment value: everything spent during an appointment. Average appointment value: this industry specific measure excludes walk-in retail sales giving you the true average appointment value, rewarding those who upsell retail product. Client rebooking: the number of clients who had an appointment that week and were rebooked within 24 hours of their appointment. Decide which performance measure to use. Enter their target amount. Done! 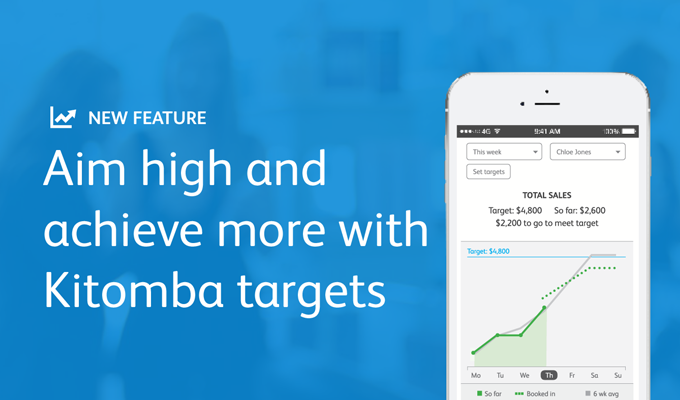 With Kitomba targets staff can only view their targets, while as the owner or manager, you can set and track all targets. Check in on how you’re progressing on the salon desktop while you’re creating a new appointment, grab the salon tablet or pull targets up on your phone – Kitomba targets can be viewed on any device. 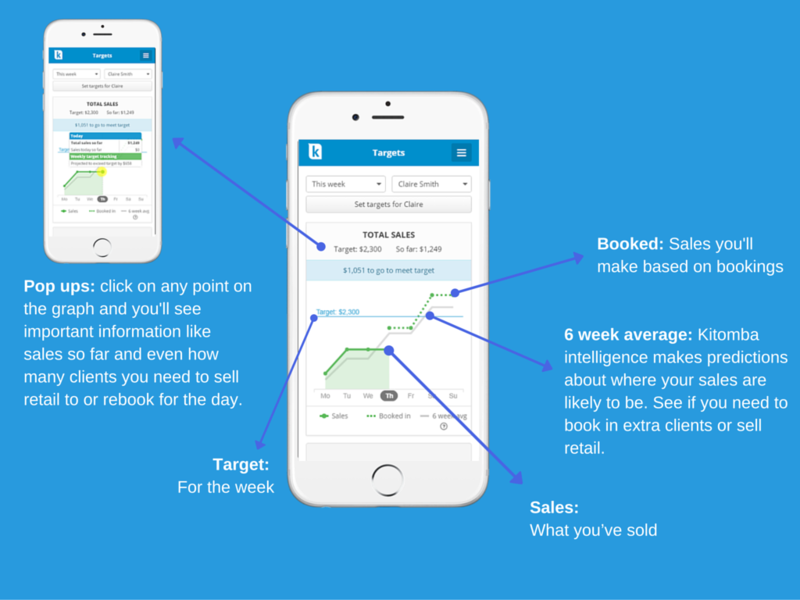 Mobile optimised and available in up-to-date real time, it means you can check your targets anywhere, anytime. Take 15 minutes to sit down and create your business and staff targets. It doesn’t take long, so get them loaded and start achieving! Get your staff to check their target every day – first thing in the morning is good. While they’re at it, they should check their personal daily appointment list in Kitomba 1 too and identify clients who need a colour and retail. If you have some time, one-on-one meetings with your team to talk targets and strategies is a good way to get them motivated. Eventually, get your team to discuss their targets and how they’re tracking at the end of your morning meetings. Kitomba’s created an easy way for you to motivate your staff to increase your business performance! You’re now also able to give your staff the power to track their own progress. It enables them to achieve their targets and be self motivated, and lets them know what to do if they’re lagging behind. The days of your staff running another report or getting their calculator out are gone. Kitomba targets gives staff real time secure access to how they’re tracking towards their personal targets from their mobile or tablet anytime. Remember to set them up with Kitomba 1 limited user access. Do you love Kitomba targets and want to share your story? Get in touch by emailing marketing@kitomba.com. Where can I find targets? Log into Kitomba 1, you’ll find targets in the top toolbar. Do I have to pay for targets? No you don’t. Targets has been made available to all Kitomba customers automatically! Just log into Kitomba 1. If you can change business and staff settings, then you can set targets. It’s easy to ensure you as the owner or manager can only set targets, just check your permission settings. If I give my staff access to targets can they access all my business data too? We’re constantly thinking about how the changes we make and new features we build require security changes – so there’s no need to worry. With the release of the personal daily appointment list, scoreboard, photos and now targets, we created a new security level “limited user access” so you can give your staff access to these awesome features while your data is totally secure. It only takes a few minutes, so log into Kitomba 1, pop into the settings tab and give your staff Kitomba 1 limited user access. To see how check out our support guide. Can my staff see everyone’s targets? No they can’t. When set up as a limited user, they only have access to their own targets, just like the scoreboard and daily appointment list. The targets are fabulous, Thanks Kitomba! I know I’ve asked this several times, but is there any chance in the near future there will be a report that will based on staff utilisation hours, to produce an average hourly earn rate? For week/ month? Thanks for your feedback Karin, we’re so glad you’re loving targets! We value your feedback and we’ve had other customers ask for this too. We’re actually working on developing a KPI to show average hourly work rate, so keep an eye out for emails from Kitomba and on our blog for it’s release. Fabulous! Can you please just confirmt he difference between ‘who did work’ and ‘designated sales person’? Hi Olivia, ‘who did the work’ is exactly that – your staff members targets will be calculated based on the work they themselves completed. Whereas ‘designated sales person’ is for situations where you want your stylists targets to be based more on if it’s their client who comes into the salon. For example, a stylist’s client comes in for a cut and colour. They may have another team member assist in applying the colour for them, but they complete everything else (the cut and style). By selecting ‘designated sales person’ the clients stylist would have the entire service (colour, cut and style) added to their service target. Please let us know if you’d like us to explain this further!